Comments: The antenna is still working and good quality. Comments: The parts do work, but I had to have someone install them and they didnt fit my car properly so they had to "rig" them to work. The antenna didnt fit in the hole properly so it does not go all the way down. Stays up approximately 4-6". Cost me extra to get it installed-because we couldnt get it to fit but even a professional said that it was aftermarket and didnt fit correctly. Comments: I am a 47 year old female and had no problem installing this piece. The instructions were easy to follow, the part was a perfect fit and works perfectly. This was a fantastic transaction, fast shipping and excellent service!! Comments: The antenna works great. I did have a little trouble fitting the black outer trim, but it all worked out great. Comments: Installation was not as easy as the document implied. The problem is that there is not much space to work in and I needed a screw driver not a ratchet to loosen the base. Also it would have been useful to say how the cable was attached at the top of the original antenna not somewhere on the bottom where I originally looked. But it is installed and function and looks great. Comments: Easy to install if you have thin arms. Other than that it was great. Comments: I did not install the antenna and the mechanic me it was a bit tricky, but it looks good and is working very well. Comments: Removal of original antenna was a pain, took an hour or so. The replacement is made well and looks awesome though it is not an exact fit for the original holding bracket. With a few tweaks I got it in and it works great!! Thanks guys!! 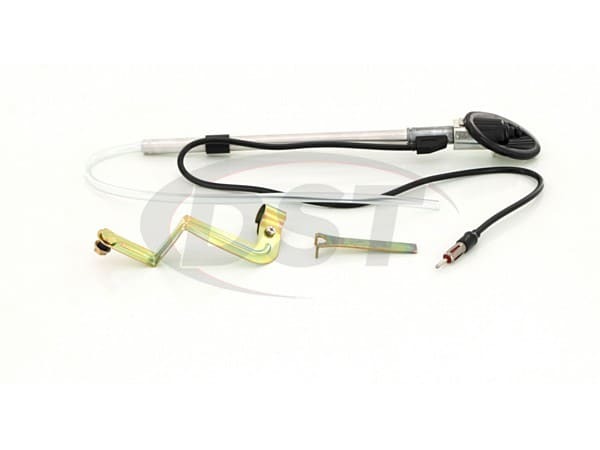 Comments: I bought this for my 95 Honda Del Sol because I broke the antenna off, this antenna was easy to install...This antenna also gets very good reception as well, all this for a lot less money than buying the OEM part. Comments: Fast shipping. My son installed the Antenna, everything is great. Comments: Highly recommend this as a replacement for a broken antenna on a Honda del Sol. Comments: Installed the new antenna yesterday and it looks and works great. I can finally hear those low signal stations I couldn't get with old broken antenna. Easy to install once I figured out how to use the included fender nut tool. Only suggestion would be to include a simple instruction sheet. Very happy with the product!! Comments: Easy to install, required getting a additional antenna wire to reach radio in the Honda Delsol but that was readily available. Provides great reception and looks good. Comments: Install was very easy to do. Comments: The new antenna works great. Keeps a low profile when all the way down, but I run it mid-range so I can get better reception. My HD stereo works so much better now! Comments: The part worked great. Install was tough, but only because there wasn't much room to work. Thoroughly pleased. Thanks. Comments: Its a good replacement, but to be honest I was actually looking for the antenna delete. However; it was discontinued for whatever reason. Comments: This wasn't as simple as swapping out the broken antenna stick, rather the whole components will need to be replaced. It is however, an easy installation and requires the inside panels to be removed. Comments: The instructions were complete and easy to follow, the whole thing was a pleasure! I installed the new antenna in my 94 Del Sol. The only area the instructions did not match my car were the screw that is part of the mounting hardware. After some playing I just felt around since the screw head is on the outside (fender side) of the car. Then I used a mirror, and sure enough my car (original equipment) had a round head phillips screw, so the 5/16ths socket was not going to work out. Used an offset phillips screwdriver and got a few scratches, but it worked out. I probably should have placed a rag on the metal of the small opening and then I could have avoided the scratched arm. Also probably due to climate (salted roads) the metal from the top of the antenna would not release from the fender, so I placed a screwdriver into the antenna hole and tapped a bit until it released. Installing the new one was a cinch after that. After waiting a year for inventory to become available, I finally snagged one. Replaced the antenna in about 15 minutes on my 97 Si. I ended up loosening the screw that held the bottom of the antenna mast wiggled the old one out and put the new one in (Didnt use the included bracket). Im not quite sure how to use the bracket actually as I didnt appear to have the 'nut' that was mentioned in the instructions, but worked just the same. Thank you for a good OEM replacement!!!! Comments: i ordered this antenna and boy am i glad. my old one was complete garbage so i ordered this and less than a week later i got it. instalation was a snap, nad just consisted of removing all of the rear interior pieces and simple bolt ons. i highly suggest buying this antenna kit if you really need one. Comments: The kit arrived as scheduled - thanks!� I just wish I had smaller fingers to get inside the Antenna Well as there was not much room to get to the existing retaining screw on the mounting bracket. Once I was able to get the screw loosened the rest was easy. �My Del Sol is a black one and the black anodized finish on your replacement blends in beautifully. Comments: I don't know if this is how it goes for everyone but this is how it went for me. First of all Installation is not as straight forward as the directions make it out to be. For starters the removal tool you get is too small to use on the oem antenna, so you definitely have to use a set of needle nose pliers. Second the 5/16th nut (weird size for a japanese car since they use metrics over there) which they talk about is really a phillips head screw. So when they say a wrench "might" be useful it's more like you better have wrench with a phillips screwdriver tip or you're not getting that sucker off. Oh and even though the factory mounting bracket is bigger than the replacement antenna forget about changing it with the supplied one, unless you have a hamster that can do some wrench work for you. Finally the fitment outside the car was perfect. The removal tool provided really helped out here. The black anodized antenna looks really clean and the reception is awesome (it could be thanks to the fact that the antenna can come out like 4 feet..lol). All in all I would recommend this product, just prepare yourself for the installation. Installation: Not too difficult. Be careful with the removal tool. Mine slipped and scratched the panel (glad I have a maaco job) a bit as well as bent when tightening the new antenna. I had the whole swap done in about 15 minutes. They do not mention how small the area to work in is and that its way back into the trunk. Also not mentioned is if you ever want to use the mounting bracket supplied for the bottom of the antenna you have to go inside the car and remove trim panels to do so, though it does not seem like support at the bottom of the antenna is really necessary. Quality: The mounting components seem sturdy enough. My only complaint is the mast itself, which does not feel super secure in the housing. There is a good amount of play in all directions once the mast is fully up. Seems like it would flop around a lot in the wind and could possibly damage itself. Reception seems fine, but I can only compare it to my previous broken off mast. Comments: The above review is extremely accurate. I replaced my antenna with one of these and experienced exactly what he mentioned. However, after having it installed for about a year I had a bad day. You know, the type of day that bad things happen in 3's? Well, the third thing was going through a gas station car wash and having it ripped out because i didn't put it down (the second thing was having gas dump all over the side of my car at the pump, resulting in my "free" carwash). For those that care the first thing was work related and unimportant. Anyway, after suffering with no antenna for a couple months I had to come back and get another antenna, for the price this option can not be beat. I'm not looking forward to the install, as it is a pain as mentioned, the result with be worth it. If you are looking for a great replacement at a great price this is the one. I got my antenna about a week after I ordered it, which is not bad at all. Installation was really easy, but there were a couple issues with my particular install. Firstly, as others noted, the 5/16" bolt is actually a Phillips head screw, at least on a '95 S. A ratchet definitely is helpful though, so be sure to get one that you can hook a screwdriver bit to. Probably a good idea to tape things together so the bit doesn't fall off inside your Sol! It really is tight in there too, so use your smallest ratchet. I should also mention the stock mounting bracket is far too large to properly clamp down on the new, slimmer antenna; you'd have to stick something else in there to shim it, or otherwise use the included hardware. It doesn't seem to make much difference once the top part of the antenna is in place though, so I'm not worried about it. One more thing: the paint (I thought this was anodized?) on the antenna is not really on there too good. Just pulling it out and adjusting it for length resulted in a thin ribbon of paint being shaved off by the adjacent telescoping piece. So be careful with it if you want it perfect-looking. Comments: Thank you so much for providing the 'How To' instructions on installing the new antenna for my del Sol. They were smack on the money and I was able to install it with no blood or cursing. Best of all, I didn't have to translate it from Chinese/English. It was well written and provided helpful tips. Keep up the good work! FULL instuctions here. Instructions include actual pictures so you'll have a better idea what's going on.